...massage therapy, skin care, spa therapy and hydrotherapy for your relaxation! For that special gift of relaxation, add just the right touch from our available caramels, cheesecake bites, chocolate covered strawberries, truffles and flowers. A minimum of 72 hours notice is required to add these items to a service. These items must be prepaid and are non-refundable. Call our spa, 812-287-8024, for pricing and to place your order. Our Mini Retreat spa package is ideal for someone who wants it all, but doesn’t have all day. 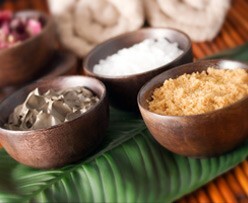 Our Grand Retreat spa package is the ultimate in head to toe relaxation and rejuvenation! The Grand Retreat will leave you feeling relaxed, refreshed, smooth and glowing from head to toe! What a great way to spend your day! Please allow 4 1/2 hours for this package.